The minimum-cost multicommodity flow problem involves si- multaneously shipping multiple commodities through a single network so that the total flow obeys arc capacity constraints and has minimum cost. Multicommodity flow problems can be expressed as linear programs, and most theoretical and practical algorithms use linear-programming algorithms specialized for the problems’ structures. Combinatorial ap- proximation algorithms in [GK96,KP95b,PST95] yield flows with costs slightly larger than the minimum cost and use capacities slightly larger than the given capacities. Theoretically, the running times of these algo- rithms are much less than that of linear-programming-based algorithms. We combine and modify the theoretical ideas in these approximation al- gorithms to yield a fast, practical implementation solving the minimum- cost multicommodity flow problem. 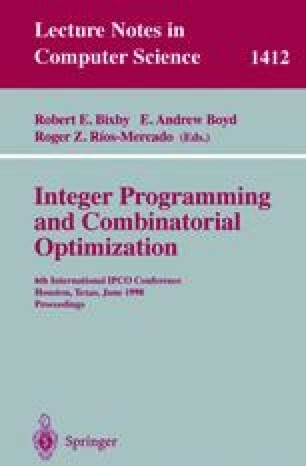 Experimentally, the algorithm solved our problem instances (to 1% accuracy) two to three orders of magni- tude faster than the linear-programming package CPLEX [CPL95] and the linear-programming based multicommodity flow program PPRN [CN96]. Research partially supported by an NSF Graduate Research Fellowship, ARO Grant DAAH04-95-1-0121, and NSF Grants CCR-9304971 and CCR-9307045. Research supported by ARO Grant DAAH04-95-1-0121, NSF Grants CCR-9304971 and CCR-9307045, and a Terman Fellowship. Research partly supported by NSF Award CCR-9308701 and NSF Career Award CCR-9624828. Some of this work was done while this author was visiting Stanford University.